Much has to be done before you head out on a vacation or business trip. Keeping track of everything you need to finish before you leave can be a headache. That’s why the travel checklist template from Microsoft was created. With the Microsoft travel checklist, you can ensure that everything important is taken care of before you ship out. You can leave your stresses behind with the free travel checklist from Microsoft. Click the link to download it and get started today! The travel checklist is a formatted Microsoft Excel template. You can type in information or write it in by hand after printing it off. Because it’s a Microsoft template, it can also be converted into a Word or PDF document for easier printing. Next to each task is a spot to mark off when the task is complete. There is also an additional area on the travel checklist to add any notes that may be helpful. The travel checklist is customizable, so you can add or remove the formatted items if necessary. 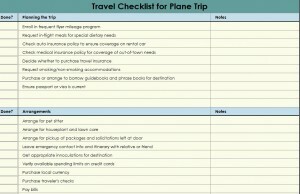 You can also change the font or color scheme to make the travel checklist template easier to read. Before entering your car or boarding your flight for your next trip, download and print the free travel checklist template from Microsoft.